Ukraine is undertaking a decentralization process to give citizens more control of decisions that affect their lives. During the past two years, the Policy for Ukraine Local Self-Governance (PULSE) project has strengthened a network of local leaders and organizations. This network is increasing citizens’ participation and working with local governments to increase transparency and accountability. PULSE is a five-year initiative funded by the US Agency for International Development. IREX and the Association of Ukrainian Cities jointly implement the project. Since 2016, PULSE has fostered crucial dialogue between local leaders, communities, and media practitioners through meetings and events. Thanks to PULSE, 122 local librarians and civil society organization (CSO) representatives from 62 amalgamated or soon-to-be-amalgamated communities are now prepared to facilitate citizen engagement and information sharing. These representatives have received training on topics such as increasing communities’ access to information and facilitating engagement between local communities and government officials. Their efforts are filling a gap in communities where there has traditionally been a disconnect between civil society and local governments. Applying the knowledge and skills gained in training sessions, CSOs and libraries have organized 312 community engagement and informational activities for Ukrainians throughout the country in support of decentralization reform. For example, a group of PULSE participants created a working group within the Bar City Council. The working group held all of its meetings at the Bar library. Through the meetings, the working group and representatives of the local government coauthored a strategic plan for the city. The plan is being integrated into local self-governance policies to improve roads, schools, health-care facilities, parks, and cultural institutions—all community initiatives that citizens identified as priorities for public investment. 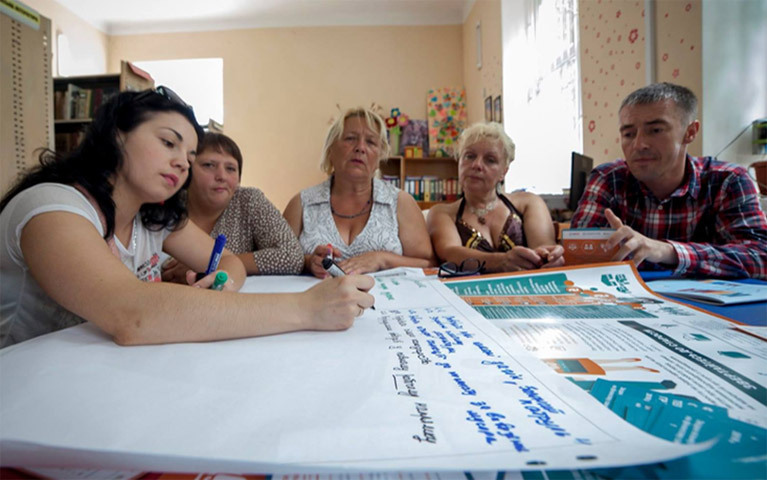 To support long-term collaborative relationships between citizens and the newly elected local self-governments, IREX has also fostered the establishment of 61 community reform groups across Ukraine. Through the groups, individuals with key interests in community well-being—especially leaders in professional, social, and business sectors—have been building alliances and cultivating a spirit of cooperation between community members and government officials. Members of community reform groups, together with their elected officials, develop and implement citizen-driven initiatives to improve well-being in their communities. Their goal is to further incentivize effective long-term engagement with local governments. PULSE also revitalized existing oblast-level, library-based press clubs initially developed by the Bibliomist – Global Libraries Ukraine program. PULSE started the process of establishing and building capacity of additional press clubs throughout Ukraine. The press clubs support decentralization reform by liaising with local media organizations that cover citizen engagement activities. The groups write about local successes and share information about resources that are available to decentralized communities. To date, press officers that PULSE trained have been featured in 238 articles, TV segments, or radio spots on local decentralization efforts. With two years to go, PULSE is emphasizing the importance of local ownership of the decentralization process. The project is working in close collaboration with local reform representatives to promote comprehensive decentralization reform. Training materials that IREX developed for PULSE are available online for public access, including the Facilitator’s Guide for Community Outreach and Engagement, the PULSE Manual on Decentralization Reform, and the PULSE Facilitator's Manual for Library Press Clubs. This project is made possible by the United States Agency for International Development and the generous support of the American people. The project is jointly implemented by the Association of Ukrainian Cities and IREX.